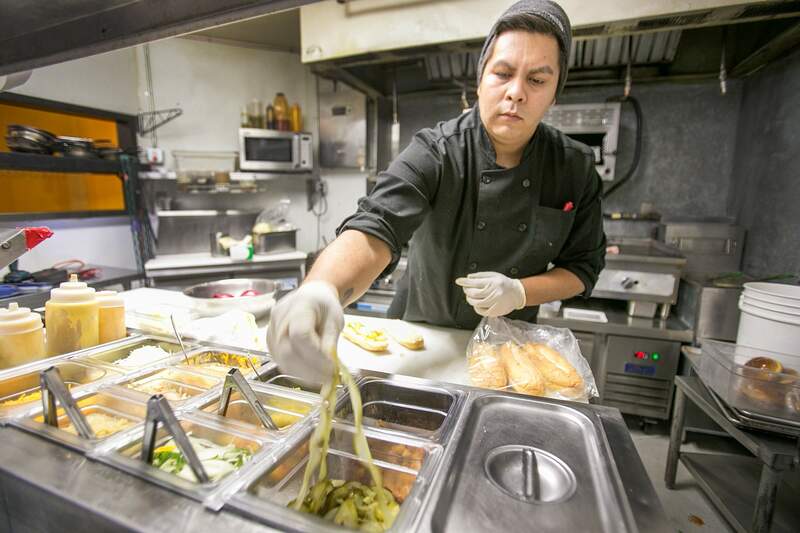 Devin Parrish, a cook at Brew on College Drive, prepares a lunchtime customer’s order in the kitchen. Vannity Silva-Davis, right, talks to Marie Kehm, a career councilor for Employment First, at the Colorado Workforce Center Monday. Increases in the minimum wage that will become effective in January may be a challenge for some small businesses. In November, voters approved an increase in the minimum wage from $8.31 per hour to $12 by 2020. The minimum wage for tipped workers will rise from $5.29 to $8.98 per hour. As the January increase approaches, which will be an initial 99-cent per hour boost, businesses need to assess their costs, said Bethany McManus, a consultant who works with some downtown businesses, including independent bars and restaurants. “My only advice I can really give is they get out in front of it as soon as they can,” she said. From year to year, sales for some bars and restaurants have been flat, so increasing prices or cutting hours may be the only immediate ways to absorb the rise in wages, she said. She is concerned businesses may not see enough new sales from the increase in minimum wages or those new sales may not come fast enough. In addition to the increase in wages, businesses will also see an annual increase in payroll taxes and insurance costs because they are based on wages, she said. For a small bar and restaurant with 15 employees working a combined average of 475 hours per work week, the increase will mean an additional $30,000 in costs during 2017, according to her estimates. By 2020, that business could be paying $100,000 more annually in wages, taxes and insurance than it was in 2016, she said. At Brew Pub and Kitchen in downtown Durango, Erik Maxson is not planning any immediate changes to absorb the increases in wages. But he is wary of them and may consider changes to staffing, prices and hours, he said. He wants to pay his employees appropriate wages, but the new standard doesn’t seem appropriate for a rural area, he said. “It seems like a heavy burden to be placed on small businesses, young businesses, even established ones,” he said. At the Colorado Workforce Center in Durango, job postings from minimum-wage employers, such as restaurants and lodgers, have continued to flow in as usual, said southwest regional supervisor Chloe Wiebe. It could be hard to tell in January if the increase in minimum wage is having an immediate effect on employment because that tends to be a slow time anyway, she said. During the campaign to increase wages, advocates for the increase argued that the minimum wage increases were measured and would create more benefits for the economy than harm. “Historically, this has not caused the kind of catastrophic event that people were talking about,” said Maureen Maliszewski, director of La Plata County Thrive! Living Wage Coalition. The increases are meant to put more money into the local economy by giving low wage workers more money to put into the local economy. At Fort Lewis College, all of the regular employees make more than the minimum wage. But about a third of FLC’s student workers, about 200 people, will see increases, said Mitch Davis a spokesman for the college in an email. However, about 60 percent of those 200 students are employed through a work-study program with a set amount of total wages, so they will not earn more, they will just need to work fewer hours overall, he said. While the increase in wages is a positive step, Maliszewski said, there is still more advocacy work to be done, because what employees need to make in La Plata County has already outstripped the $12 per hour that will be phased in by 2020.